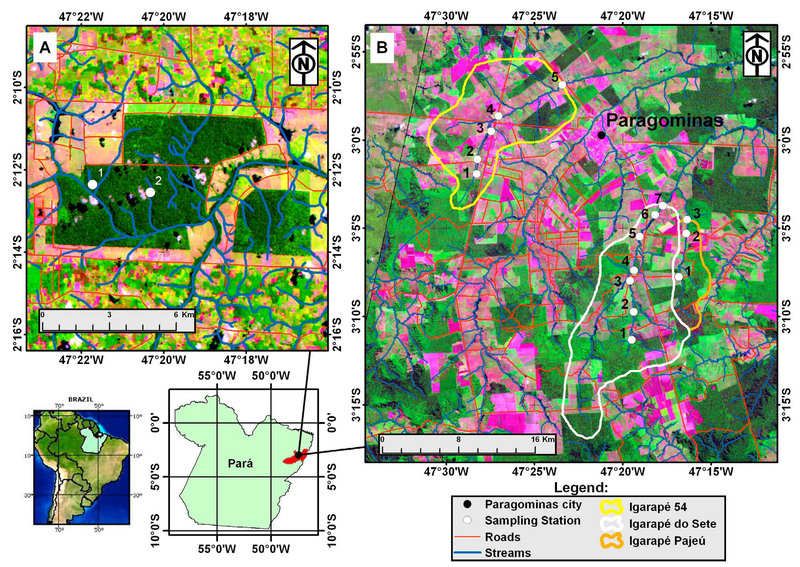 This data set includes measurements of dissolved nutrient and organic carbon concentrations, as well as dissolved oxygen, alkalinity, conductivity, turbidity, pH, and discharge from three streams located in mixed land use (crop fields, pastures, secondary vegetation, and forest) and two streams in entirely forested landscapes near Paragominas in the state of Para, Brazil. Stream water samples were collected during two different periods: 1) weekly from August 1999 to July 2001 at location Igarape 54, Station 5 and 2) monthly from April 2003 through October 2005 at all of the stations. The exact start date and suite of measurements vary by location. In addition, samples from precipitation collectors at the Paragominas Meteorological Station were measured for major ion concentrations every two weeks from 1999 to 2001. There are two comma delimited ASCII data files with this data set. Figure 1. (a) The two pristine headwater streams and sample locations identified in Capitão Poço (indicated by the white dots and the numbers “1” and “2”) that are part of the Arauaí River Basin (2002 LANDSAT imagery); and (b) the three study watersheds in Paragominas, with stream sampling locations identified by white dots (2004 LANDSAT imagery). Study sites are shown in relation to the Brazilian state of Pará and to South America. These TM Landsat images present composite coloring, where band 3 is blue, band 4 is green, and band 5 is red. Areas with green tones are associated with presence of significant biomass, whereas those with red tones indicate significant exposed soil. The investigators were Davidson, Eric A.; Markewitz, Daniel; Figueiredo, Ricardo de Oliveira; Araujo, Thereza Cristina; Bastos, Therezinha Xavier; Costa, Fabiola Fernandes; Cunha, Ewerton da Silva; Pacheco Jr., Alvaro Castro; Leite, Tania de Sousa; Schuler, Marysol A.E. ; Pacheco, Nilza Araujo; Portela, Gilvane Azevedo; Silva, Marilia; Silva, Patricio de Souza and Souza, Alex Henrique Moreira de. You may contact Figueiredo, Ricardo de Oliveira (ricardo@cpatu.embrapa.br). Between August 1999 and October 2005, dissolved nutrient and organic carbon concentrations, as well as dissolved oxygen, alkalinity, conductivity, turbidity and pH were measured in water samples from five streams located in mixed land use (crop fields, pastures, secondary vegetation and forest) and entirely forested landscapes in the state of Para. In addition, water samples from rain collectors were collected and analyzed for some nutrient concentrations. There are two comma-delimited ASCII files with this data set. Missing values are represented as -9999. CP1-1 -2.2015 -47.357 Igarape Santa Maria headwaters in Capitao Poco, Station 1 (not actually a stream but seeps of the headwaters). Problems during data collection resulted in suspect values; only pH and CO2 are reported for this site. CP2-1 -2.20361 -47.3392 Igarape Arauai headwaters in Capitao Poco, Station 1 (not actually a stream but seeps of the headwaters). Problems during data collection resulted in suspect values; only pH and CO2 are reported for this site. These data in combination with rainfall amount and streamflow data provide essential information for nutrient budgets for differing land-uses. Moreover, stream chemistry data combined with land use class quantification at each catchment sector can be used to evaluate land use change effects on water chemistry. Data have been reviewed and there are no known problems or expected revisions. Standard solutions (Environmental Research Associates, Arvada, CO) were used with all analyses for quality assurance. The main limitation was that discharge measurements could only be done once a month and in only a few stations. No information was provided on precipitation sample collection or analyses. To better quantify the hydrochemistry under fully forested conditions, two streams approximately 100 km distance from Paragominas were also sampled. These catchments contribute to the Arauaí River in Capitão Poço municipality (sampling sites CP1 and CP2 in data file #1). The two streams are within a working ranch that has been managed according to Brazilian laws and thus has retained a 3,700 ha segment of unharvested mature forest. All sample handling and analysis were the same as for the three streams in Paragominas. The watershed area for these forested streams are much smaller (<20 ha) but are characterized by similar geologic and pedogenic history (Figueiredo et al., 2010). Sample points, which were determined by issues of accessibility due to privately held land, were identified at five locations on IG54, seven locations on IG7, and three locations on IGP. Stream water grab samples were collected in previously acid washed 250-ml polypropylene bottles. No preservatives were used in the collection vessels. Bottles were filled to capacity to minimize headspace and were placed in cold storage (~4 degrees C) within a few hours of collection. Samples were filtered in the field through 0.4 um polycarbonate filters (Millipore) and stored at 4 degrees C until analyses for the other chemical constituents in an EMBRAPA laboratory in the city of Belem, 300 km distance from Paragominas. All sample handling was the same for the two streams located approximately 100 km from the three Paragominas catchment sites. No information was provided on precipitation sample collection. At the time of sample collection, turbidity, pH, temperature, and dissolved oxygen were measured in situ by, respectively, a turbidity meter (Hanna, model HI93793), and a pH, temperature and oxygen meter (WTW, model Multiline P3). In a field laboratory in Paragominas, and after conductivity measurement (conductivity meter VWR, model L702674), the samples were analyzed for alkalinity by endpoint titrations with 1 mM HCl to pH 4.5. Stream discharge was estimated monthly at a subset of sampling locations from July 2004 to June 2005 by measuring cross sectional area and flow with a current meter (General Oceanic). This measurement was done at the most downstream sampling stations in each stream for which a good cross section could be obtained (IG54-5, IG7-6 and IGP-2). In the laboratory the samples were analyzed for dissolved organic carbon (DOC), dissolved inorganic carbon (DIC), and total dissolved nitrogen (TDN) by combustion (Shimadzu TOC V CSN), and Cl, SO4, NO3, PO4, Ca, Mg, K, Na, and NH4, by ion chromatography (Dionex DX-120). Dissolved organic nitrogen (DON) was obtained by the difference between TDN and the sum of NO3 and NH4. All analyses were the same for the samples from the two streams located approximately 100 km from the three Paragominas catchment sites. No information was provided on precipitation sample analyses. For C02 the water samples were collected from 20 cm below the stream surface using 60 cc syringes. Syringes were transported to a field laboratory. 30 mL of water was injected into a serum bottle with 30 mL of CO2-free air and incubated in a water bath for gas and liquid phases to come into equilibrium. Headspace CO2 concentration was determined using LiCor IRGA. The CO2 in the original streamwater sample was calculated, adjusting for temperature (Henry's law), acidity (bicarbonate chemistry), and correcting for fugacity. Figueiredo, Ricardo O.; Markewitz, Daniel; Davidson, Eric Atlas; Schuler, Azeneth Eufrasino; Watrin, Orlando dos Santos; Silva, Patricio de Sousa, 2010, Land-use effects on the chemical attributes of low-order streams in the eastern Amazon, J. Geophys. Res., 115, GO4004, doi:10.10292009JG001200. Davidson, Eric Atlas ; Figueiredo, Ricardo O. ; Markewitz, Daniel ; Aufdenkampe, AK. Dissolved CO2 in Small Catchment Streams of Eastern Amazonia: A Minor Pathway of Terrestrial Carbon Loss. Journal of Geophysical Research, 2010 (in press). Markewitz, Daniel ; Resende, Julio Carlos Franca ; Parron, Lucilia ; Bustamante, Mercedes ; Klink, Carlos A ; Figueiredo, Ricardo de Oliveira ; Davidson, Eric Atlas . Dissolved rainfall inputs and streamwater outputs in an undisturbed watershed on highly weathered soils in the Brazilian Cerrado. Hydrological Processes, v. 20, n. 12, p. 2615-2639, 2006. Markewitz, Daniel ; Davidson, Eric Atlas ; Figueiredo, Ricardo de Oliveira ; Victoria, Reynaldo L ; Krusche, Alex Vladimir . Control of cation concentrations in stream waters by surface soil processes in an Amazonian watershed. Nature (London), England, v. 410, p. 802-805, 2001.